The development—and hopeful adoption—of this treaty represents a breaking point with the status quo, with subservience to the powerful, with the patriarchal world order of massive nuclear violence. Whatever happens on Friday, this treaty has already impacted the nuclear establishment and, more broadly, international relations. Its adoption and implementation will bring even more positive change. This is important in a world where governments that support the continued existence of nuclear weapons are actively investing in their modernisation and maintenance. 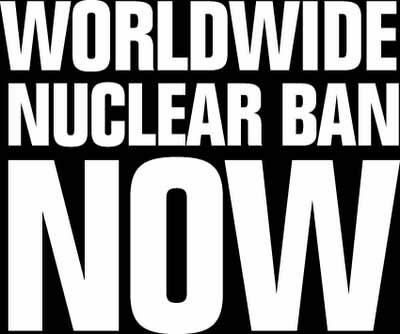 Just this week, a review commissioned by the German parliament determined that “the country could legally finance the British or French nuclear weapons programs in exchange for their protection.” It is exactly this type of activity that the nuclear weapon ban treaty will help prevent. As the New York Times notes, this plan “would face steep public opposition and diplomatic hurdles.” After tomorrow, it will (if the ban is adopted) also be in contention with international law. Thus the nuclear weapon ban treaty will help prevent future risks to humanity, as Vanessa Griffen of FemLINKpacific said to the conference. It will also “address the damage caused by past development of these weapons through nuclear testing,” she said, noting that the treaty contains “vital provisions for the people, land, and oceans that have borne the brunt of nuclear testing.” This treaty was borne out of the recognition that the humanitarian and environmental impacts of nuclear weapons are catastrophic. This provided the motivation for governments around the world to finally break the taboo against pursing new international law on this issue without the support of the nine countries that possess nuclear weapons. It was a daring move, supported and inspired by the courage of civil society actors and parliamentarians that wanted to challenge the status quo and take real action to create a better future. On Friday, as they decide whether to adopt this treaty, states have a choice to make. Are they for nuclear weapons or against them? Do they think it is legitimate for a handful of heavily militarised countries to be able to commit instant genocide? These questions have, over the years, been drained of their stark vibrancy, black and white muddled to grey. This was deliberate. Concepts like nuclear deterrence replaced the horrors of burning flesh, flattened buildings, and generations of cancers. The ban treaty brings everything back into focus. What kind of world do we want to live in? What kind of world do we want to actively build, against the interests of the structures of power that rely on violence, intimidation, fear, and hate to sustain themselves? “Simply banning nuclear weapons is not simple at all,” said Senator Ludlam. It has taken decades of activism, years of discussions and strategising, and months of complex negotiations. Now we are here, with a simple question on the table and majority of committed states standing around it. For or against?